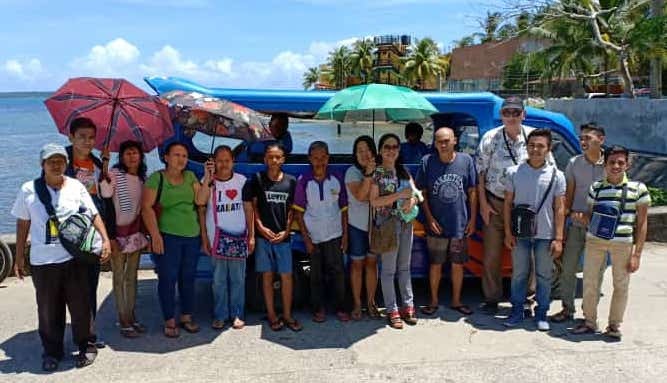 SAMAR, Philippines (BNC) by Jamie Suiter — Daniel Hamm and his wife Kathy have been working with the churches in Eastern Samar the last few weeks with great success! This is Daniel’s second and Kathy’s first trip to the island of Samar. Last week he was teaching and preaching at the Borongan City church and the Bible Study Center, which serves as an outreach of the church to the nearby Eastern Samar State University students. Although this is the primary focus of the Bible Study Center others do attend who are interested in New Testament Christianity as well. Those who obeyed the gospel had been studying with Edwin Inso at the Bible Study Center for some time and, on Mar. 12, made the final decision to put on Christ after a few studies with Daniel. Most of these conversions were young teens and college age people, but Lucis Caturday, who is 80 also decided to be baptized this week. Edwin and Daniel had brother Rudy Cahulogan, who is retired from the military do the baptizing. This week Samar Bible School is in session and Daniel is teaching several lessons each day. January marks the third anniversary of Samar Bible School and this month is the five-year anniversary of the Bible Study Center. What is so exciting about this work is not only training and teaching young preachers and Bible class teachers to fill the void in the Samar churches, but the young people at the Bible Study Center will take their faith all over the Philippines as they start their new life after they receive their degree! The church has a good retention rate in that those converted stay as they are well grounded in the faith. Several brethren from all over have supported and helped financially and with prayer. The Bible Study Center was built with funds left over from typhoon relief work done by Disaster Assistance church of Christ and finish work from the Lay Lake church in AL. The preaching school is supported by the brethren at the Madison church in AL, and the Director Edwin Inso is supported by the Lay Lake church also in AL. The Hamms have been involved in missions in Southeast Asia for 15 years. Daniel Has a Masters in Bible from Freed-Hardeman University and a degree in agriculture from Murray State University in Kentucky. Daniel’s work is overseen by the Walnut Grove church in Benton KY. Please keep these new Christians and the work in your thoughts and prayers. Jamie Suiter is the USA Representative Liaison for the Eastern Samar congregations.